It has been a while since I’ve posted here so naturally I thought the best way to ease back in would be to post 24 recipes in 24 days at the busiest time of year. If you were here for last year’s bakemas you know it was a little bit of a fail; I had so many things to do, I was not organised in the slightest, I was late with posts and...I didn’t actually finish it (even though I did all the work) but shh. I’m not going to harp on about how I’m going to be way more organised this year because well you never know with me, I’m just keeping my fingers crossed. This year however will be a little healthier than the previous two...although I emphasise “a little” I’m not going full on making 24 days of salads it’s more making slightly healthier choices without having to give up enjoying your holiday or feeling like you’re missing out. So shall we get to the cookies? 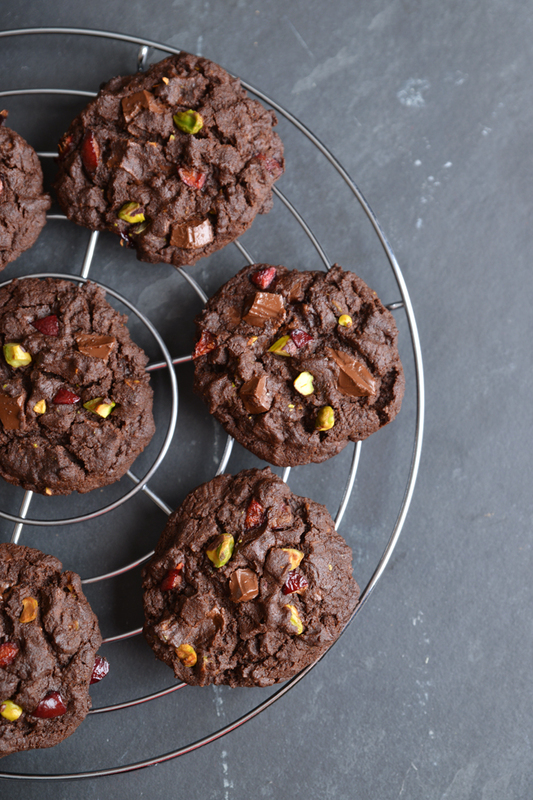 Double chocolate chip cookies that taste a little like a brownie cookie crossover, music to my ears! I always make mine with coconut sugar and honey/agave syrup but you can stick with the standard brown sugar and golden syrup if you prefer. 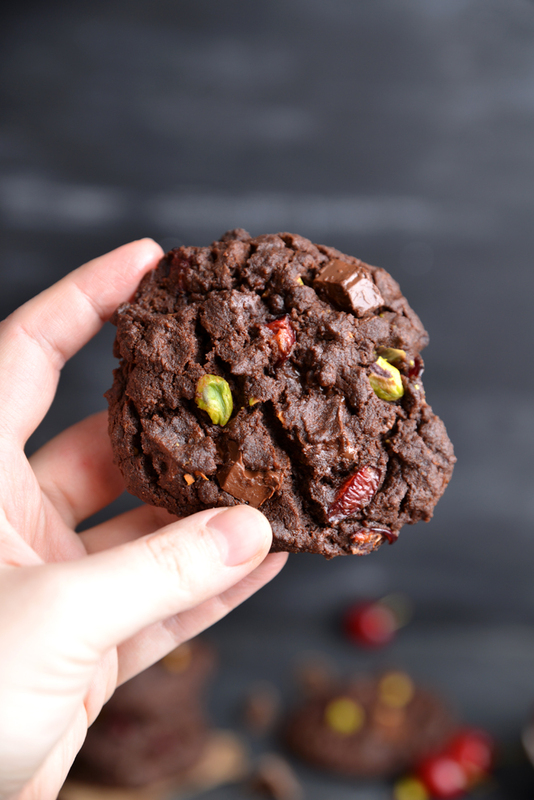 I used fresh cherries instead of glacé cherries so there’s no extra sugar added there, throw a few pistachios in there for some crunch and obviously you can’t have double chocolate chip cookies without some dark chocolate chunks. Beat the butter and sugar together until creamy, add in the honey/syrup and beat again until smooth. 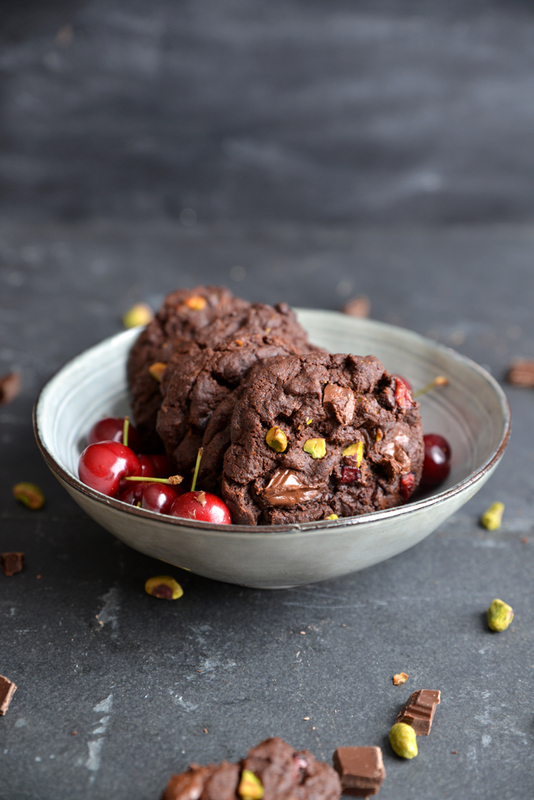 Add in the rest of the ingredients and mix until everything is fully incorporated then spoon onto a baking tray lined with grease proof paper. 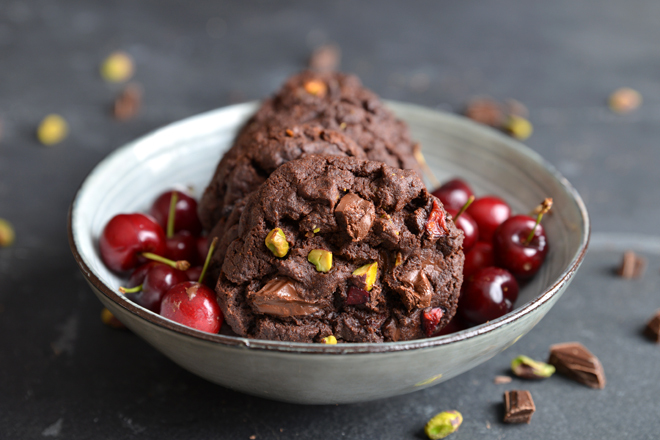 Top with a few extra bits of chocolate, pistachios and cherries and bake for 12-14 minutes. Note: the cookies will come out of the oven soft if you’re worried they’re not cooked lift a cookie slightly and check a bottom has formed. 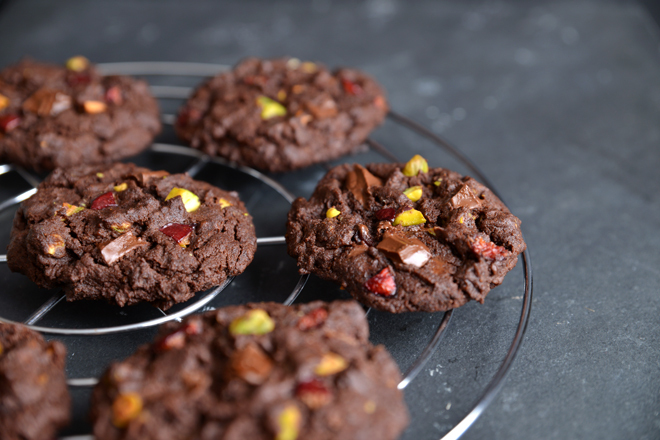 These look like such fancy and delicious cookies!